Physicists dream about finding bumps, or excess signals in the data. Bumps tend to point to something new that cannot be explained by the Standard Model, which gives the currently best understanding of the universe in spite of its deficiency to explain several important observations. The search is exciting, as it has a history of small bumps that could point to new physics. 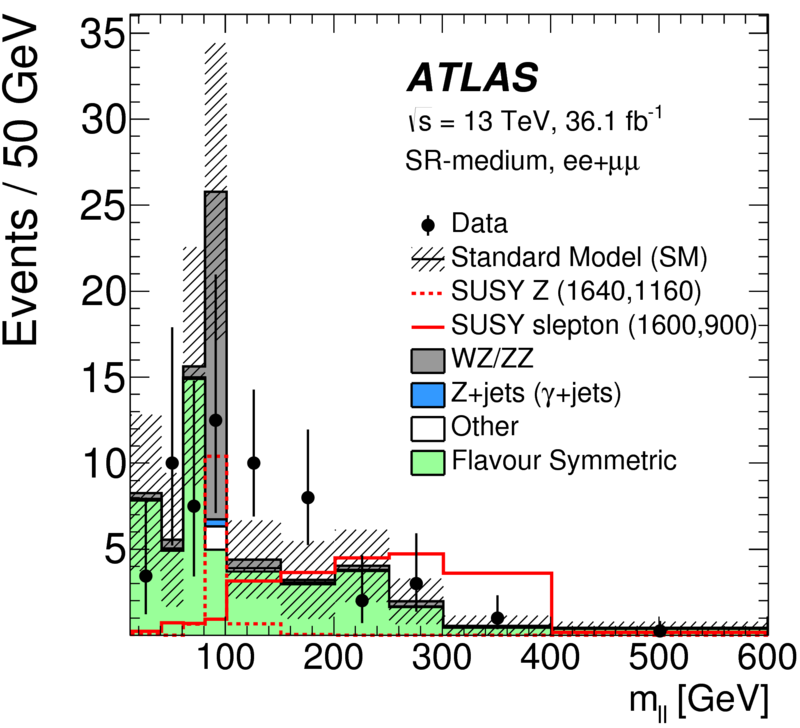 The ATLAS and CMS collaborations both reported moderate excesses in searches with two leptons, jets and missing transverse momentum using the 8 TeV LHC dataset. For ATLAS, there was a bump in the data around the Z boson mass, while CMS reported an excess in data at a slightly lower mass. As neither experiment was able to confirm each other’s findings the first time around, a repeat was scheduled for Run 2. After waiting through the first long shutdown of the LHC, both ATLAS and CMS checked each other’s analyses with new 13 TeV LHC data and ruled out any excess. It was time to move on, to update the searches to target new possible bumps at 13 TeV. The new ATLAS paper reports on a search for new physics processes beyond the Standard Model, taking advantage of the larger Run 2 dataset. The new ATLAS paper reports on a search for new physics processes beyond the Standard Model, taking advantage of the larger Run 2 dataset by requiring stricter, more signal-like criteria that reject more Standard Model background events. The expected shape of the lepton invariant mass distribution is exploited to identify either an “on-Z” mass peak, or an edge structure in the distribution indicative of a kinematic endpoint resulting from SUSY particle decays, as shown in Figure 1. By lowering the transverse momentum threshold for the leptons, the search additionally probes more “compressed” SUSY signal models, where the difference in mass between new particles is small. This results in lower momentum, harder-to-detect decays in the detector. Could SUSY be hiding within these more difficult-to-find models? In this case, it appears not. No excess has been observed in the Run 2 data so far, and so these results further extend our limits on excluded SUSY models, as presented in Figure 2. With the excesses reported by ATLAS and CMS at 8 TeV now a distant memory, all eyes have turned to the full Run 2 dataset currently being collected, as we continue to explore the corners where new physics might be hiding.